Thank you...yes...we had dirt everywhere, even on the side of the fridge!!!! Zero benefits & a few liabilities. Concrete will eventually become abrasive & it it is non porous. As far as structural integrity, it offers none. 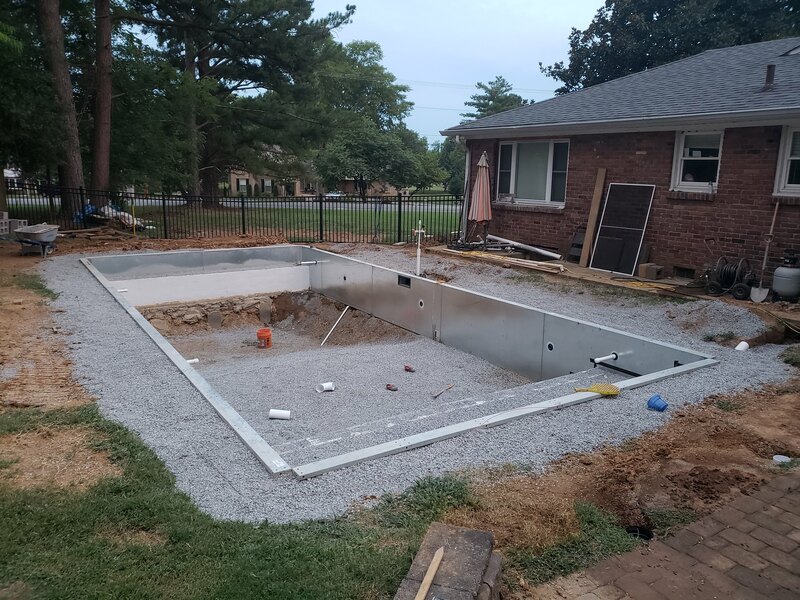 pool floors shape dig & decouple liners from the earth..
We hit a boulder the size of a volkswagen at 5'8", so that's all she wrote. Due to the boulder, no way to get a sump pump down there. I did run 1" PVC to the deepest point, so I can pump water out from the top if I ever need to. Probably not idea, but better than nothing, I guess. What do people do when the sump pump dies? Just replace it when they replace the liner? Post a pic of where ur at w dig. U can find anywhere on edge of rock to get a little deeper for a sump pit it's temporary u pull it when ur almost done w the vermiculite and get liner in b4 it rains. How deep was the pool planned for? Ohhh...I thought you meant you were leaving a sump pump in under the liner/vermiculite. Luckily, I don't have a groundwater issue, so as long as it doesnt rain, it is dry as a bone down there. I was torn. The pool I grew up in was 5'6" (5'2" water depth) deep end. 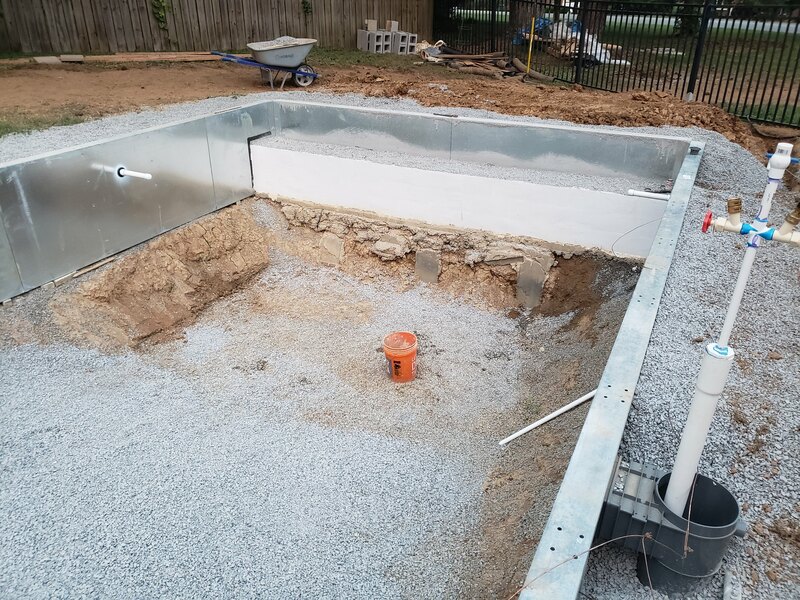 My parents moved, and put in a new pool, and it is 6' (5'8" water depth) deep. I am 5'7" and wifey if 5'1". Pool I grew up in, I could stand on tiptoe and wander the deep end, which I liked, and we never had any issues hitting bottom when jumping or even shallow diving. The 6' pool, no chance, on tiptoe Im still an inch or so shorter than water depth, however, it is fun jumping in and swimming to the bottom. 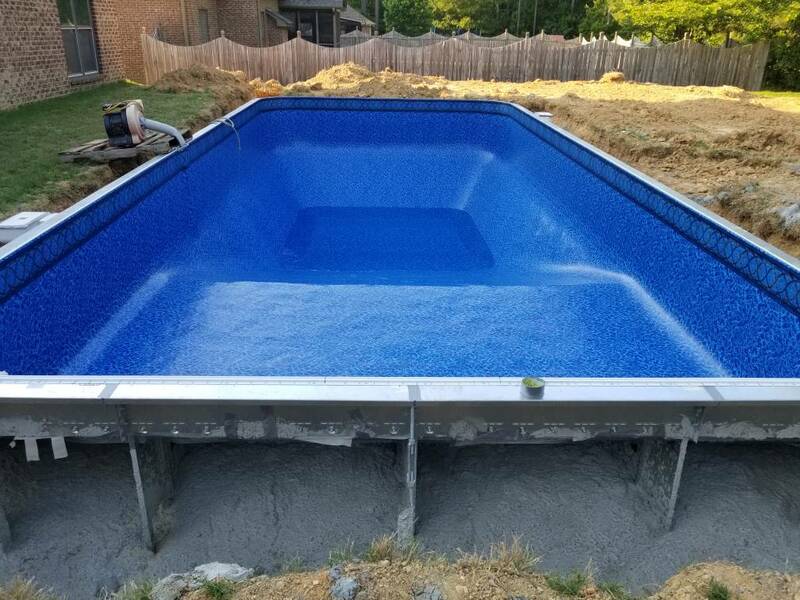 I am not sure if it is really much different in that respect or if it is the darker liner on the new pool that gives it a "deeper" feeling. 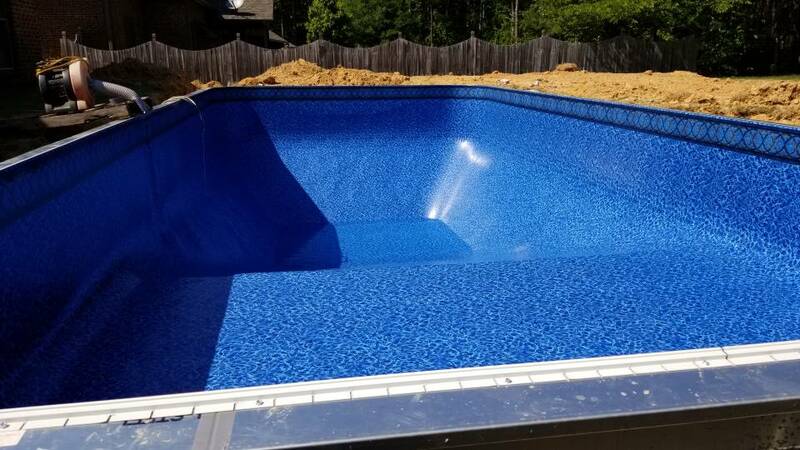 She has a dark liner on new pool, and while you can see the bottom in full sunlight, it just looks really deep...kinda that whole "you can't see the bottom, must be deep". The old pool had a standard 1990s liner, and there was no "mystique". As it sits, right now I can hit 5'8" depth (5'4" water depth) deep end with no rock demo. We are also planning on a mid-range liner, not light and not dark, so Im kinda getting the average of the two worlds (depth and liner color), which is fine by me. If I stick with this depth, then all my numbers for the slopes work out well, so I think Im just going to call it good. We are members of our community pool, and they have a 10' deep end with a 1 meter board, so I figure if we want to dive, we will go there. I'm in the middle of completing a Diy in Alabama. I've learned a lot on this forum & will be glad to answer any questions but you can find most answers from the experts here. Save some money & do the liner yourself. Liner measured and ordered. Everything still looks like a ginormous mess. Working on finishing my steps and bench, electrical, and plumbing. Then ready for backfill. 1-2 weeks until liner gets here. 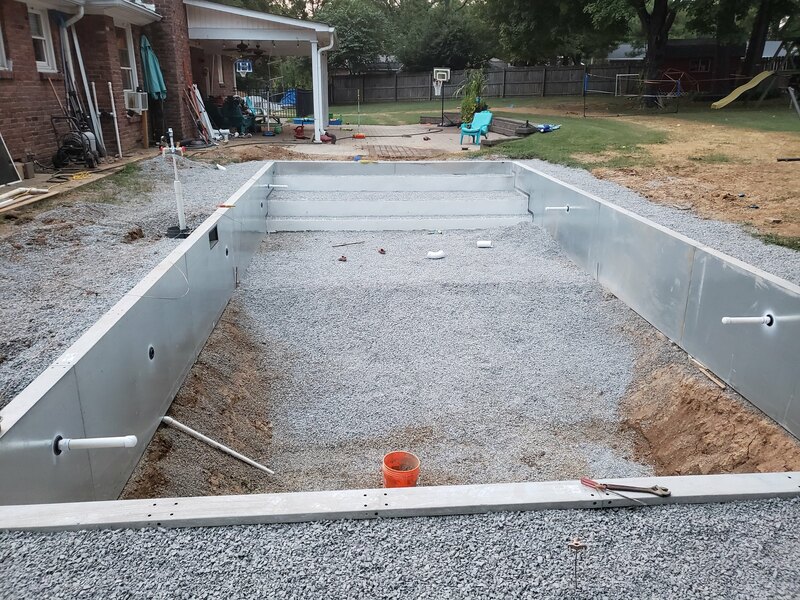 Pool guy is going to pour the 20" deck, vermiculite floor, and install liner. Price for all three things wasn't too much more than just having him do any of them separately. Easier for them to be here three days than to show up for a day and a half. I love that liner! I bet that is going to give some pretty water!! These are my other two favorites. Steps and bench are "custom". I built them using concrete block. The first course is mortared with footing. The following courses are dry-stacked, with a surface bonding cement coat applied to give it strength. Then all was backfilled with 1/2" gravel. You can't tell in the picture, but the long side of the pool furthest from the house has a lake view through the side yard. So sitting on the second "step/ledge" or sitting on the bench, we can see the lake. Plan is to hit the lake on the weekends, then come home and swim and grill burgers and dogs. Seems like a good way to spend the summer. Toss in some baseball and soccer to keep us active, and we will be rocking. So how about taking a pic of lake you can see and play in! What fun that will be. Just make sure to push your FC up towards the top of your range when you do go into the pool from the lake as you sure don't want to introduce anything "extra" from the lake. Do you have your test kit yet? If not you need to go ahead and order so we can make you a shopping list for your pool. LOL...i have my hot/cold outdoor spigot so we can wash off before getting in. And yes, I have the TF100 and the speedy stirrer! My Lowe's has 10% liquid chlorine, and I plan on using that or regular bleach in a pinch. Otherwise, just add CYA as needed and ph +/- as needed. 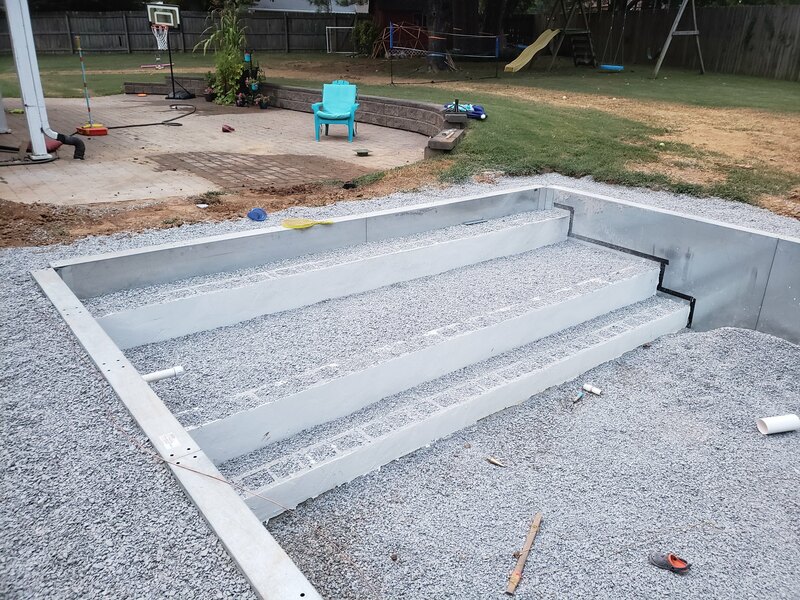 I understand the weight of the water will keep the liner down, but I am curious how you will keep your liner attached to your steps? Don't steps typically have a track on each step to hold the liner in place?